This second release focuses on the maturation effect of ex-Port casks on Irish Single Malt. By choosing a complimentary range of vintages, sizes and styles of Port cask matured and finished Single Malt whiskey, the Brabazon Series No. 2 captures all the unique flavour and character Port casks can impart. 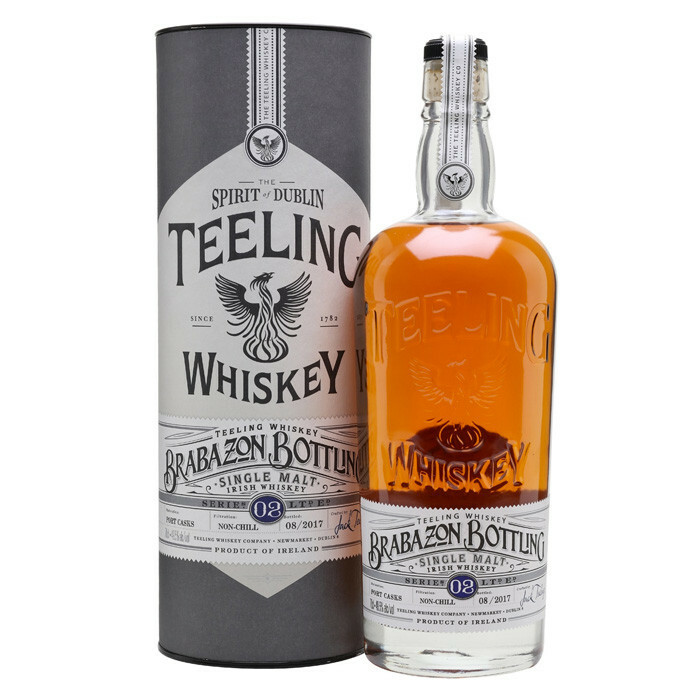 Limited to 12,500 bottles worldwide and is presented in a clear white flint embossed and debossed Teeling Whiskey bottle showcasing the unique ruby red colour of the whiskey, rounding off a truly unique Irish whiskey to savour. Honored World's Best Irish Single Malt No Age Statement in World Whiskies Awards 2019. Taste: Raspberry, a touch of mineraly flint and dried oak spices, stewed apples and poached pears. Ripe blueberries and blackcurrants, Victoria sponge cake with plenty of cream and jam, cinnamon, honey. Raspberry, a touch of mineraly flint and dried oak spices, stewed apples and poached pears. Fizzy strawberry sweeties, dark chocolate and brown-sugar-dusted porridge.